During our stay on Komodo, two big Komodo dragons had the habit of hanging around in the camp, the one in the picture on the right, seemed extremely lazy. It never moved from this place, near the staff kitchen, except to turn around or move a couple of meters to one side or the other. 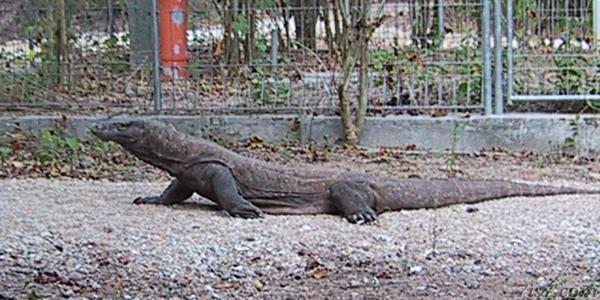 But komodo's most famous resident is probably this giant male dragon (see picture below). It seems not to mind the presence of humans and walks around the camp all the time. It must be the most photographed wild lizard in the world! All the buildings in the camp and the village are built on stilts. It gave us a sense of security, until we saw this dragon climb into a building and settle down in the corner of a room. That's apparently how much it feels at ease in the camp. The PHPA guards tried to chase it out by moving large pieces of furniture in its general direction. It clearly disturbed him, and he eventually left the building. It didn't seem very happy about it however. It has a particular scar on the lower back. It's difficult to see it on this picture unless you know it. We recognized this ora on a Discovery Channel program. It will just settle down on a walking path, forcing everyone to walk around. In the picture below you can better appreciate the dragon's size. It's a shame that this extraordinary animal is endangered. 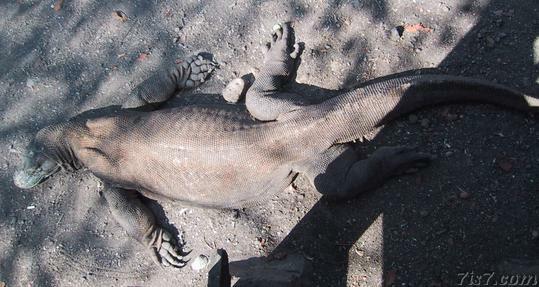 The number of dragons on Komodo dwindled from more than 3000 in 1990 to slightly more than 1000 in 2001. It's not exactly clear what causes this decline, but usually the poaching of deer, their favorite food is said to be the culprit. 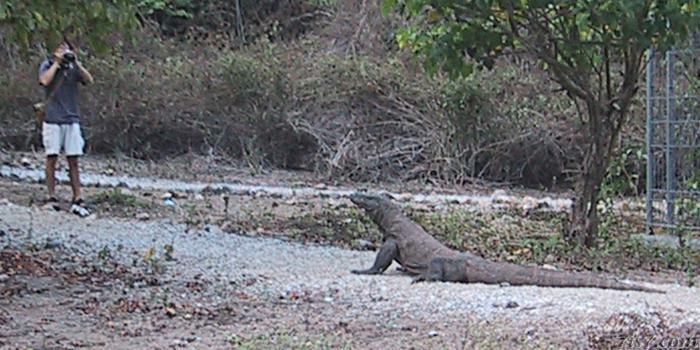 Big Komodo dragon on walking path. Giant fruit bats, flying foxes, hanging in trees. 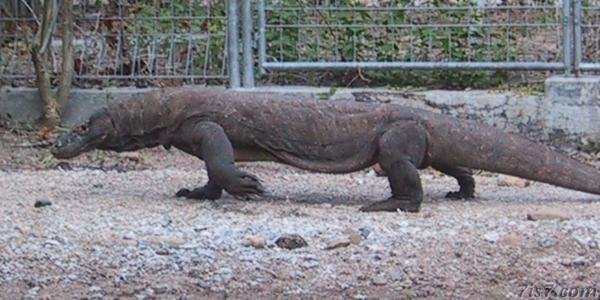 On Komodo everything is bigger! 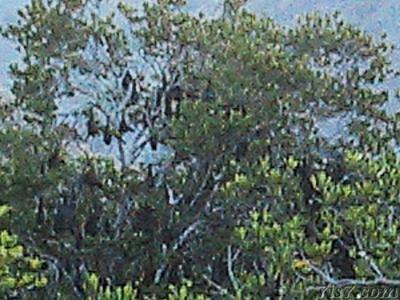 Besides Komodo dragons and the 30cm long geckos with whom you share your room, there are also giant fruit bats that live in the mangroves on and around Mangrove Island just off Komodo. They are usually referred to as flying foxes because their faces look like that of foxes. At sunset they fly off by the thousands, an impressive spectacle. These bats have a wingspan of up to 1.5 meters. Unlike European bats they fly on sight. Unfortunately even the best things come to an end. 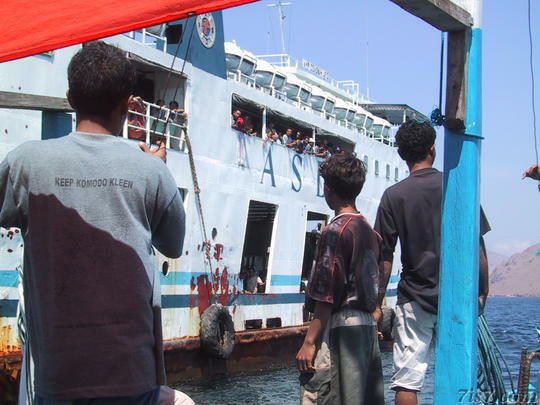 On Saturday the 11th of August, we had to take the ferry to get back to Bali in time for our flight back home. I am definitely going back to Komodo one day. Host your site with Dreamhost, a fully featured host, and get up to $97 worth of discounts with our Dreamhost Promo Codes.